How were you introduced to the sport of dragon boat racing? 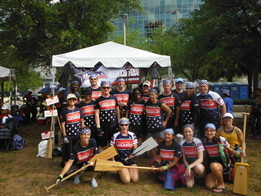 When I moved to Tampa I was fortunate enough to get a seat on the Lifestyle dragon boat team in 2010 for the Tampa races. From there the Lifestyle coach encouraged me to join his team. I have been racing with Tampa Bay Paddling Club since then. I loved the speed of the boat, the paddles in sync, the teamwork and the excitement of racing. What do you love most about being a paddler? I love being on the water, my teammates and the adrenaline of racing to the finish line. I love the camaraderie and the friends that I have made from other states and countries. The dragon boat community is an extended family. Everyone is so friendly and fun. You meet people from all over the world with one common love - dragon boat racing. What inspired you about the military to start a new team? I got involved with Hope for the Warriors in 2010, became the captain of the Tampa Running team in 2013. 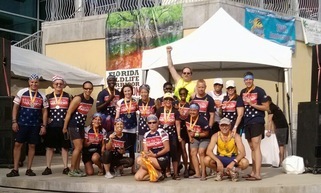 My inspiration for starting a dragon boat team started when I saw the Leathernecks (from The Villages, FL) racing a few years ago. I saw an opportunity to give our Tampa military members a fun team water sport. I wanted see more military members involved in the sport. I wanted to give them an opportunity to cross train in a new sport and something different than their daily PT. It is one way I give back to the brave service members that have sacrificed to keep our country free. I am always looking for more team members. What are the goals for this new team? 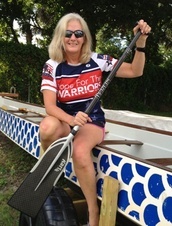 My goals are to continue to build the Hope for the Warriors team, to include a female team and youth team and to encourage service members to get involved in dragon boat racing. We have a large military community in Tampa. I have a lot of support and help in assembling the team and I owe a lot to my teammates who have supported my idea and my coaches who selflessly give their time to coach and steer. Thanks Keith and Kitt. I owe a lot to our military service members. Please share your Camp Photos on our Facebook Page @HighFiveDragonBoat, and we will post the best each day!